Get students thinking about future careers and introduce them to a wide array of professions. Diecut photos depict real-life community helpers and the tools they use to do their jobs every day. Set includes 15 helpers, 15 tools, and 15 labels. Discovery Guide. 45 pieces, up to 15 1/2" tall. Flashy by design! Build student confidence and skills using fun-filled flash cards. 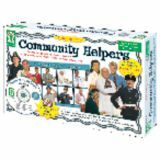 This pack, complete with activities, uses real-life photos to teach facts about helpers in the community. Watch students enjoy learning and build skills on their own or with friends… at school, home, or on the go! Durable, no-see-through cards with quick-sorting, rounded corners. 56 two-sided cards, 3⅛" x 5¼". Who makes a difference in your community? 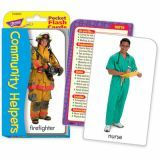 Simple text and vibrant photos introduce how all kinds of community helpers contribute. Age-appropriate critical thinking questions and a photo glossary help build nonfiction learning skills. Set of 8 books, 24 pages each. From homes and clothes to school and family, life is different all around the world. Culture makes us who we are. Grass roofed huts, blue jeans, and ceremonial clothing are all a part of culture. Each striking photograph is accompanied by a world map that shows where it was taken. Set of 6 books, 24 pages each. Reinforce listening and early reading skills, phonemic awareness, positional concepts, and much more with these Listening Lotto games! To play, students listen to the sounds on the CD and place tokens on the images on their game cards that match what they hear. 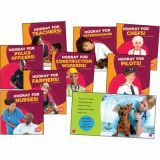 Each game set includes 12 game cards (5.5” x 8.5” each) with 8 photos per card, 120 game tokens, an audio CD, and directions in English, Spanish, and French. Neighborhoods come in all shapes and sizes. 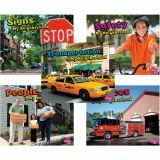 This carefully leveled series explores the people, places, jobs, and other important features of a neighborhood. 24 pages each. Set of 5 books.